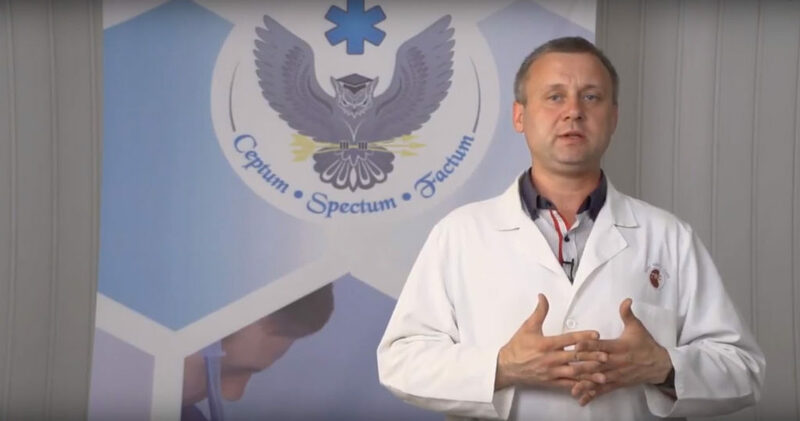 Krilyuk Vitaly Y. MD, Head of the Instructor Training Department of the State Institution “Ukrainian Scientific and Practical Center for Emergency Medical Care and Medicine of Disasters of the Ministry of Health of Ukraine”. The technique of stopping nodular bleeding from the inguinal region with the use of a hemostatic bandage. Dear colleagues, the topic of our today’s master class will be hemostasis of an external massive bleeding with the aid of modern means. First of all, I would like to mention the urgency of this issue. Actually, bleeding is a very widespread medical emergency at the prehospital stage in all countries of the world. As to Ukraine, every year we have dozen of thousands road accidents in which up to five thousand persons die. We have a fairly large number of emergencies, also of a social character, at the East of Ukraine the ATO takes place, and many people die exactly because of a bleeding as a main reason of a preventable death of injured people. What is a preventable death? It is a death that could have been avoided by using the modern means of medical aid. That is, having these modern means and possessing modern algorithms, we are able to save several thousands of injured people. What are the modern means to stop bleeding? These are tourniquets, the modern means which are used by both military and civilian medics abroad. They stop the majority or nearly all bleedings on the extremities. Its only limitation is that it should be applied at the angle of 90 degrees to the axis of the extremity, when it may be used, and it is its technology. Another method, or another type of bleedings are bleedings from non-nodal sites, that is, nodal bleedings which originate at the base of the neck, at axillary cavities and in inguinal region where we cannot use this tourniquet since it cannot be applied, and during bandaging it may slip off, and the same bleeding will resume. Therefore, another modern means to stop a bleeding are hemostatic agents. There are many types of them: biological, chemical etc. However, the most relevant and the most widespread are biological hemostatic agents, hemostatic produced on the basis of biological substances. One of the most common ones and the most actual so far in the world is chitosan. What is chitosan? In fact, it is composed of tiny particles which occur during grinding of the chitinous shells of a shellfish. These particles have a positive charge. On a contact with the blood elements, they contact with erythrocytes that have a negative charge. The mechanism of action is related to a contact of two positively and negatively charged particles which rapidly, within 35-40 seconds, form a jelly-like clot. It also allows to form a clot independently of the factors of outside environment: heat, cold and anything else; and of the internal factors, that is, the current level of the blood coagulation pathway, it can be a hypocoagulation condition, namely, reduction of coagulation or increase factors – it does not matter, it will stop a bleeding in any case. Furthermore, the content of these sachets is a Z-folded bandage which can be comfortably put into the hand. This is a vacuum sterile packaging, that is, it can be stored for a relatively long period of time. Here behind, we see the user guide. In fact, if you forget any step, you can look inside to be reminded, and perform all these manipulations in a correct way. The chitosan hemostatic dressings are already manufactured in Ukraine, it is our domestic manufacturer Yuria-Pharm. We are going to examine the algorithm of a hemostasis of an external massive bleeding, through the example of an inguinal bleeding. As you can see, because of the location we cannot use a tourniquet. It can slip off anyway. Therefore, to stop the bleeding we need, first of all, to prepare gloves, a hemostatic dressing and an elastic bandage for its fixation. As to the gloves, please note, they must be qualitative and reliable, and also tailored to your hand, so that you could easily put them on without worrying that they can tear off when rendering assistance. Please, remember, that blood is a conditionally dangerous substance, and during a contact with it there is a risk of transmission of an infectious disease. Now, hemostatic dressing Revul. You will see how easily you can tear this package off and extract the bandage which is Z-folded, it can be easily unpacked and it fits comfortably in your hand; it is very convenient during use as an accordion, Z-folded. This is the most up-to-date method for folding all hemostatic bandages. You keep the most part of this bandage in the left hand, and then you will tamponade the wound step by step with your right hand. Thanks to this Z-folded packaging, it is possible to do it step by step, it does not untie, it does not fall out. An elastic bandage is needed to fix this hemostatic bandage in the wound so that it would not fall out or get displaced during transportation, when carrying him or her, that is, for reliability and safety. Now, the algorithm itself: first step, I should approach the patient and make sure that everything here is safe. Remember, you should render assistance in a safe environment solely, safe for you and for your patient, so that, first of all, you would not get hurt as it would be much worse. Secondly, I must identify whether we have here, properly speaking, a massive external bleeding. It will be evidenced by, firstly, a pulsatile or intensive flow from the wound; secondly – blood stain which will rapidly spread under this patient; or, thirdly, the clothes which will be massively soaked in blood. If we see these things, it means the patient has a massive external bleeding. Now, it will be a matter of minutes since a massive external bleeding that lasts for three minutes may become fatal for this patient, so we need to do something. Before preparing the hemostatic dressing and putting on the gloves, I must somehow reduce the intensity of this bleeding. This can be done very easily, by pressing down the wound place with a knee at the inguinal region, and the blood flows less intensively. As a next step, I put on the gloves, take the hemostatic dressing, tear up the packaging, that is, I prepare everything to be able to tamponade the wound. Than, very quickly, I must assess from where the blood is flowing, from which wound, from above, from below, from the side. It is also necessary to see, in what direction you will tamponade the wound with the hemostatic dressing. I repeat once more, it is recommended to do so. I have identified, for example, that the blood is flowing from above. Then I get ready, take the main part into the left hand and form the first part in such a way that my right hand would be in a comfortable position. And now, having taken away the knee, I quickly begin to tamponade in the direction where I have identified the bleeding is, and I have pressed here, so the bleeding must be less intensive. Then with a left hand I leave the streak and put it under the fingers of the right hand with which I constantly press in the wound. Please note, I should not release it, since the blood pressure can throw this bandage away, and you would not be able to use it again. And continue doing so, quickly, we form proportional parts, thanks to this Z-folded packaging, they are formed very simply and easily. I tamponade the whole wound perimeter. I have to tamponade the whole wound and in the same time, I do not reduce the pressure with my right hand. After I have completely used the bandage, I must keep it pressed in the wound during 3-5 minutes. What for? This time is necessary to ensure that the positive and negative particles could integrate, that is, the positive chitosan and the negative erythrocyte could integrate and form a jelly-like mass. During these 3-5 minutes, I must constantly keep this pressure. After this time has elapsed, I have to look, very slowly, accurately, setting the wound loose so that not to create a pressure difference, whether the bleeding continues. If there is no bleeding, everything is okay – the hemostatic agent has worked. If the bleeding continues, it is quite possible that this hemostatic dressing was insufficient, and I must use another bandage. In our case everything is okay, there is no bleeding. Now our patient has no bleeding, however, in order to be able to hand him or her over to the medics or transport to the hospital, I fix this hemostatic agent with an elastic bandage along the wound’s perimeter. Remember that unless you are a medic, and professional doctors approach you, you must tell them you have used a hemostatic agent, so that they could note it in their documents and then transport the patient to the hospital. It is very important for the subsequent initial processing of the wound at the initial hospital stage. Well, now we are going to demonstrate this algorithm but in a real time mode. After 3-5 minutes have elapsed, as we have said, we start to look very carefully, what is happening with the wound. We see that, generally, there is no flowing, and one bandage was enough to completely tamponade the wound. And now we’ll fix it with the elastic bandage so that it would not fall out. The elastic bandage, by creating an additional pressure, gives the opportunity to reliably fix the hemostatic dressing and absolutely safely transport our patient. It is a final stage of out algorithm. We have saved the patient. And now we’ll have a look at what is happening with the hemostatic dressing directly in the wound, it means, we imagine that we are in the hospital and are able to watch at the initial, or an early hospital stage, when the patient is already in the hands of surgeons. Look, we are using an artificial blood. Although it is an artificial blood, it is very similar to the real one. Because of this, we have an opportunity to observe the whole closed cycle of this hemostatic agent’s behaviour in the wound. Imagine that this person has already been brought to the hospital. Now, we take off our bandage, you may take it off, or cut it, there is no difference at all. You can see that the hemostatic dressing sits in the wound very firmly. Now, I’ll take it out gently, with the aid of a forceps. You can see how easily and nicely it can be identified, as distinct from the surrounding tissues. You can assure yourself how tightly the wound must be tamponaded. And as a single compact and nice conglomerate, our hemostatic dressing can be taken out from the wound. Absolutely tight, no detachments, it closely sat in the wound and formed this clot. Then we see the wound that, from now on, should be processed in conformity with all surgical rules, without any problems and impacts of the hemostatic agent that was inside. Thank you.